This week’s episode of the Podcast Writing Excuses was a very interesting discussion of writing and health (mostly mental health) which was open, frank and well worth listening to. Sadly, mental health issues are a very common affliction for creative types of all kinds, and writers are no exception. “We ask the obvious question — are there more mental illnesses to be found among creative folk, or are we all under confirmation bias? via Writing Excuses 8.8: Writing and Personal Health » Writing Excuses. Cartman walked into a room, and then shot Stan, and then walked out. This is an “event”, it’s stuff happening without any dramatic element to keep the audience interested in what’s going on. Too many stories written by beginners are like this, and they lack both conflict and a dramatic core that will keep the audience interested. In short bursts this can be fine (like a single scene), but if you want to keep your audience engaged it can be murder to your story. Trey Parker and Matt Stone (creators of South Park, and Team America) offer a simple solution to this problem- you should view a story as a series of cause and effect events, and reflect that in your plotting. Old– Cartman walked into a room, and then shot Stan, and then walked out. We could go on from here as long as needed in a chain of cause and effect. This works within a scene, but it’s also a great way to structure stories between scenes. Cartman finds he has no milk and then Cartman leaves his house. (and then) Cartman goes to the store. (and then) Cartman buys milk. (and then) Cartman pays for it and chats with the clerk. (and then) Cartman drives home. (and then) Cartman eats breakfast. These are all “and then” scenes, strung together like a series of events. Let’s try using “but” and “and so/therefore” to connect them. Cartman finds he’s out of milk, and so he goes to the store. But at the first store they’re out of milk. Therefore, Cartman goes to another store. But, on the way he sees a car accident. And so he stops to help and gets involved in the rescue operation. Using “But” and “And So” almost forces you as a writer to build conflict into the story. Of course, most stories don’t just follow one character or line of plot, they often also follow other lines. Cartman discovers he’s out of milk, and so he goes to the store. Meanwhile, Stan and Kyle get ready to rob a grocery store. And so when Cartman gets to the store, Stan and Kyle are in the middle of robbing it. 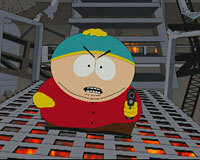 But Cartman is an off-duty police officer, and so he takes out his gun and tries to stop the robbery. But Stan spots Cartman, and Cartman is shot in the shoulder and so Stan leaves him to die on the deli floor. Meanwhile, the police respond to the alarm, and so…. The chain of cause an effect continues, and Meanwhile allows you to have multiple chains of Cause and Effect going on at the same time. When you’re planning a story, trying writing each whole scene out as a single sentence. (Or, writing out the events of each scene as a series of sentences.) See if there are “and then” or “but/and so” connections between them. If you find many “and then” connections, it likely means you’re just telling a series of events and not a story. Try to find a way to make most of them “but” or “and so” connections. Whenever possible, the “buts” should come from within characters who are making choices, not just events being forced upon them. If all the “buts” are because of outside events being done to the characters, the story will feel like God picking on them, not an interesting story about a person navigating through life. You should try to mix it up so that the “buts” are coming from a mix of physical, mental/emotional and social reasons based around the character. Physical- Cartman can’t eat pizza because he’s allergic to tomatoes. Mental- Cartman can’t eat pizza because he’s on a diet. Social- Cartman can’t eat pizza because he forgot to bring his wallet, and he’s too embarrassed to tell his friends he can’t pay for it. Be aware that it is still possible to write a really boring story using this method, and you still need a character making choices at the center of it, not just events. Things happening to a well defined character and watching them deal with it are what makes stories interesting. Also remember that “and so” includes characters changing as a result of “buts”, and those are often the most interesting stories of all! With this most recent episode (216- Complications) and only 4 episodes left before the series is over, Young Justice has shown that it is easily the equal of shows like Naruto (1st series, which I’ve felt was a big influence on YJ) and maybe superior in some ways. They managed to take the existing DC Universe and not just re-define it but enhance it and put solid twists on the various characters to make the old new, and boring into interesting. Today’s episode was as close to perfect as they’ve gotten, and it truly is a shame we won’t get to continue this take on the DC universe. Still, it’s been a good ride, and I totally give them credit for re-igniting my interest in superheros- something that had died out a long time ago. I just hit a milestone that is hard for me to grasp. As of January, I’ve sold over one million ebooks. That’s a lot of ebooks. The question I get asked more than any other is: How can I make my ebooks sell more copies? That’s actually not the right question to ask. Because there is nothing you can do to make people buy your ebooks, except maybe hold them at gunpoint or kidnap their pets. This business isn’t about what you have to sell. It is about what you have to offer. And luck plays a big part. But I’ve found you can improve your odds. Here are some things I’ve done that have seemed helpful. 1. At a glance, it should convey the type or genre of the book you’ve written. 2. It should be readable in grayscale. 3. It should be readable as a thumbnail. 4. Your name and the title should be large and clear. There are other little tips that I recommend. Usually legacy book covers have a lot of writing on them, and that makes them subconsciously identifiable as professional. Taglines. Blurbs. “By the author of Whiskey Sour”. That sort of thing. Your artist should know what vectors are, and the rule of three, and the importance of the color wheel, and all the other tricks used to make a cover pop. via A Newbie’s Guide to Publishing: How To Sell Ebooks.